This design is bold and it is brilliant. Exploring alternating depth and the physical translation of rhythm this design re-writes the rules of contemporary kitchen design. The calculated 3D profiling exposes the beauty of precision cut stone, a beauty that has been hidden for too long within benign contemporary kitchen design! The deliberate punctuation used along the length of this monolithic structure also presents an interesting canvas onto which natural light and shadow can dance a seasonal influence! There is a lot going on in this design with the basic contemporary format delivering above and beyond the call of duty! 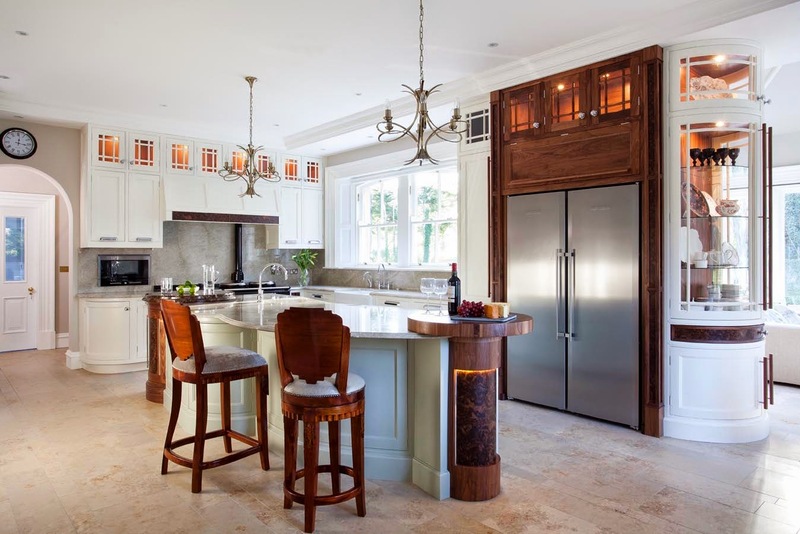 There is an introverted and narcissistic approach to this design with the mirrored door panels delivering a voyeuristic vision of the kitchen allowing the featured crisscross door pattern to become more subtly amplified. Have the reflective qualities of these particular doors been positioned in order to enhance the aesthetical impact of the design or is it something to do with the lap dancing pole! The classical styling of the posts and legs add some friction to the design but balance is restored by having these features finished in smooth, flashy chrome! All we need now are some blue lights, a glitter ball and the supersonic sounds of the 70’s! Queue the dancers! Note to self! Mirrored doors are becoming a trend – possibly a by-product of continued population growth and smaller living spaces, or are we becoming more selfishly cosmetic with our aesthetic choices? This design is simple but it manages to ignite our human curiosity with things that look a little peculiar. We may question why the island looks off set, asymmetrically unbalanced and wonder why we find it interesting? A closer examination of the design satisfies our inquisitive nature as we discover some crafty functionality integrated into this monolithic configuration! Ornate detailing can be exquisite, showcasing flamboyant flair and inherited craftsmanship but simple shapes can be equally inspiring. The simplicity of this island takes centre stage surrounded by an architecturally embedded and arguably impotent kitchen backdrop. It is interesting that the mirrored panels around the oven housing reflect the island, allowing its influence to resonate throughout the architecture. Sometimes softly spoken words can deliver tremendous consequences. The same can be said of this design! 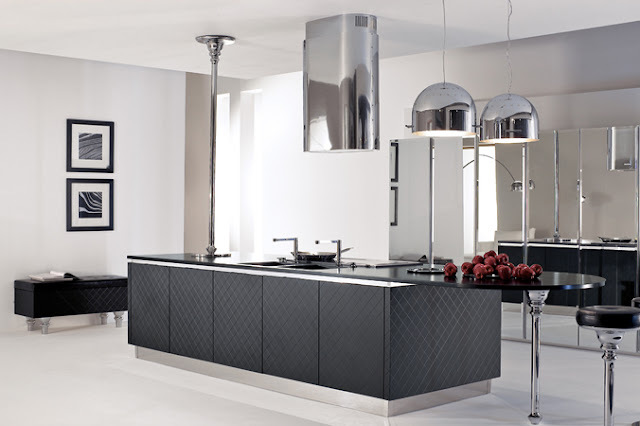 This kitchen is like a functional thread, using its smooth curvature to stitch together polarised architectural styles. The kitchen is being used like sophisticated design cartilage, preventing friction and using its irregular and undulating shape to soften the sharp distinction between architectural styles. This approach works well using contemporary cabinetry as the minimal nature of the design allows the period features to shine though without fear of being up-staged. Likewise the understated detailing flows seamlessly into any minimally styled room. 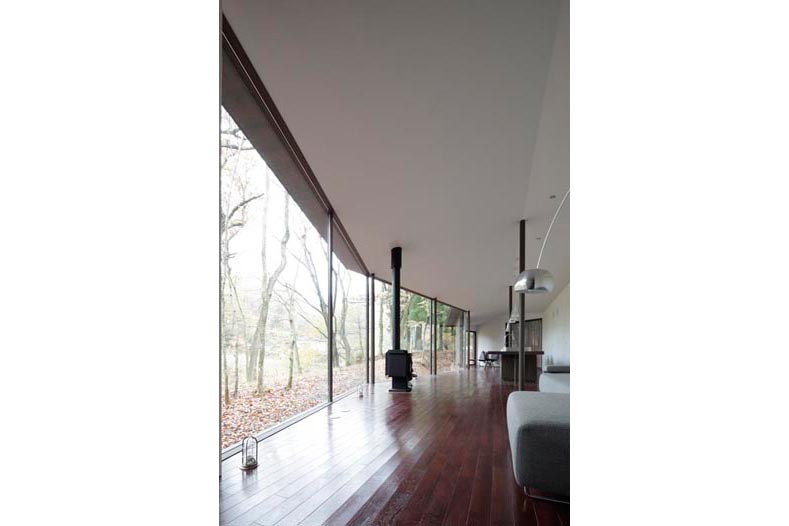 This off set cantilever is certainly impressive but you can see how it may have some practical limitations. Creating an angled feature like this can create a nip point which limits the seating on one side. The angle also allows the feature to reach beyond its natural position allowing it to become a potential obstruction! This kitchen is unplugged from the fast paced human existence that has blurred our judgement and systematically detached us from detail. 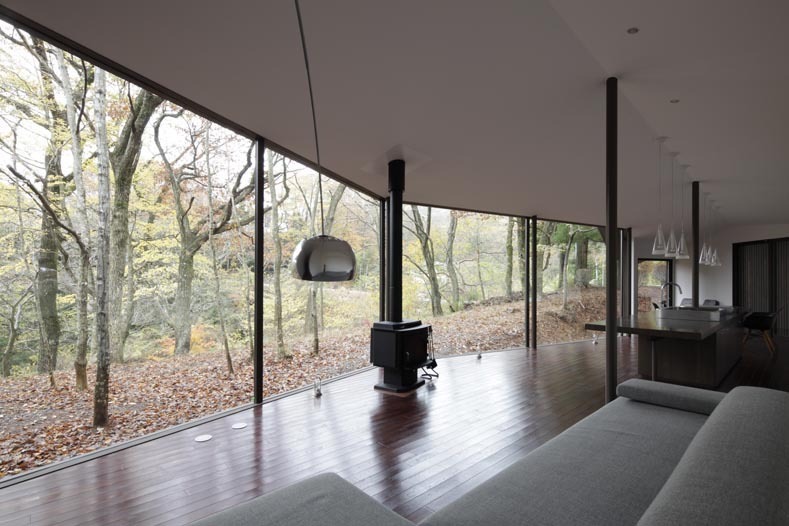 This design has opted out, rejected the rat race and embraced the idea that simplicity can deliver exceptional results. Light is allowed to penetrate the design, showcasing the warmth of the natural ash framework and enabling the angular cabinetry to display an effortless beauty. The simplicity of the design appears to invite the chaos of function, presenting itself for personalisation in a way that requires indulgence. The Mogul loves this fresh and enlightened approach! 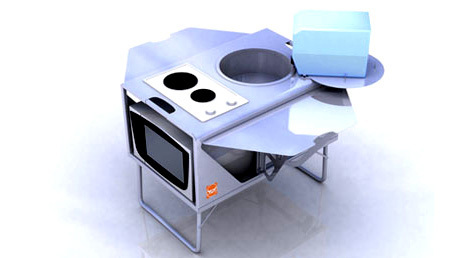 Resembling a lunar landing module this compact kitchen will allow any would-be astronaut to enjoy the pleasures of home cooking while exploring the far reaches of the galaxy. No matter what the aesthetics, architectural or planetary backdrop, if you introduce some human animation and some gastronomic aromas you’ve got yourself a homely kitchen!! In the beginning we created fire; harnessing a seemly uncontrollable element that had the power to transform our primeval diet and stimulate basic sociability. 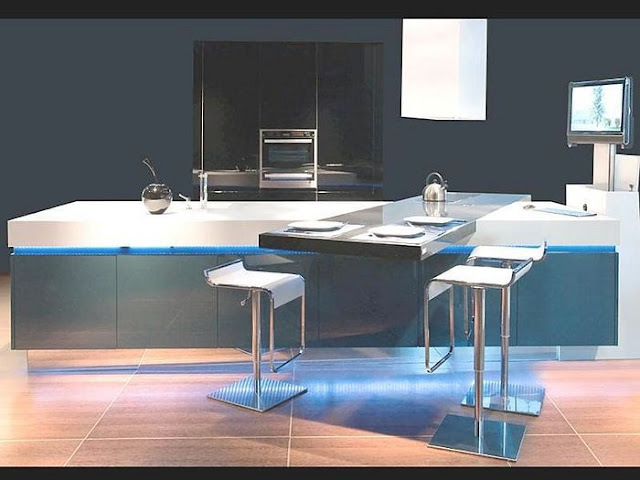 The pace of kitchen evolution has been driven by a human desire to do things better, quicker and more efficiently, that is why the modern kitchen has become a console of communication built upon a foundation of function. 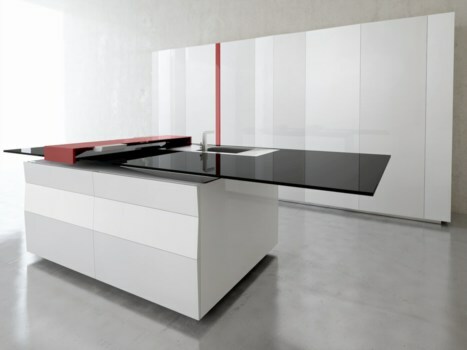 This concept by Toncelli illustrates the power and influence of modern kitchen design. If we simply wore clothes there would be no fashion, if we had stayed at home there would be no cars and if the kitchen was just for cooking we wouldn’t have designs like this! 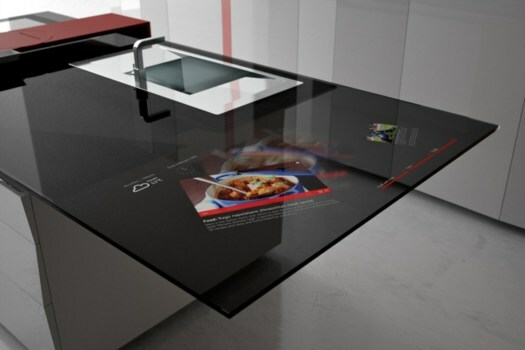 Featuring an impressive interactive, translucent worktop complete with Samsung tablet technology this design redefines kitchen function by fusing cutting edge interactive technology with primary functionality. The kitchen is evolving into a design parasite, absorbing furniture, technology and architecture in a way which could make these elements surplus to requirement. But will the integration of interactive consoles of communication within the kitchen environment lead to a reduction in the type of one to one communication required to make our society work and which ultimately helped to shape our primitive fireside society at the beginning of time?! Only time will tell! There is a simple purity to this design that disguises a cunning technological complexity. The designers have indulged our innate love of natural materials and geometric form to create a kitchen which can only be described as an exemplary functional art exhibit. This fantastic design has been lovely fashioned from solid ash boards and the functional services have been carefully entombed within the rich warmth of the timber. The simple shape of the island defies convention presenting a minimal but highly functional preparation and cooking area. 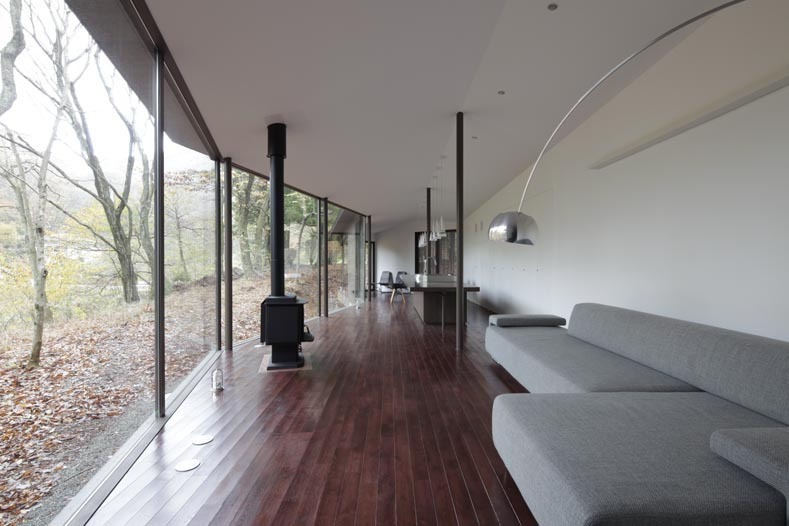 The functional and aesthetical requirements are completely satisfied though the introduction of a socially inviting cantilever which naturally runs off the main surface of the island. And if the island wasn’t enough, lurking in a background is a show stopping transformer with the visual and functional power to floor any onlooker! This is kitchen design supremacy! The kitchen pales into insignificance awaiting functional resuscitation within a sanitised architectural space. We see the kitchens functionality diluted and absorbed into the architecture with only the island presenting influence upon the space. 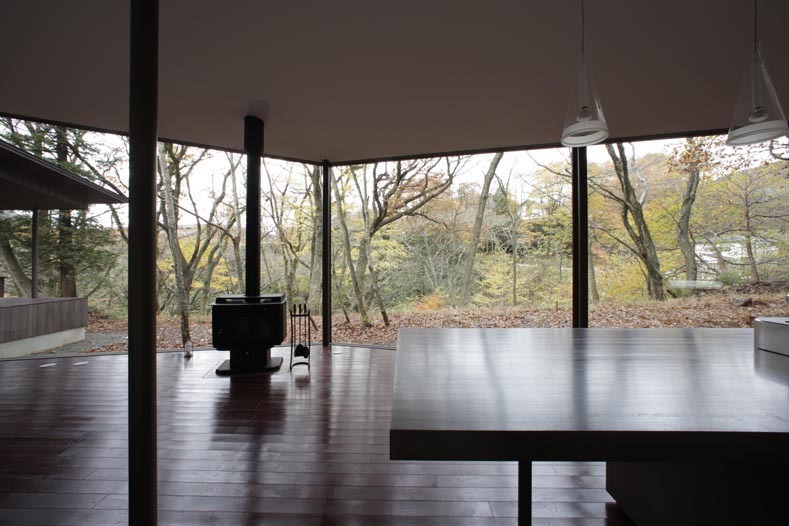 Both kitchen and architecture are submitting to the imposing influence of nature. Possibly a little human animation required here? !